Newly refurbished Anna May makes her maiden voyage! 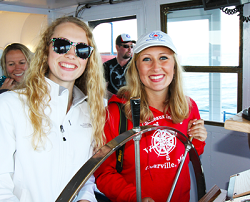 Make your wedding or group’s experience in the Straights of Mackinac area an extra special one! Star Line’s Party boat the Anna May, has been completely refurbished and she is ready to delivery an unique experience for private parties, weddings, rehearsal dinners, dinner cruises, and area tours. Wedding vows can be officiated on board by a Star Line captain or you may supply your own clergy. We also have caterers available who can create a dining experience to the level you desire. Star Line’s Wedding Package offers special discounts, complimentary perks and special charters. Details of customer service is our priority, helping the bride and groom to make travel arrangements a smooth enjoyable experience. Call us today to receive personal assistance with customized details for your wedding or group travel needs. 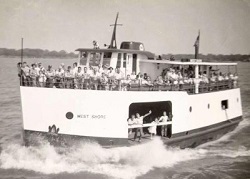 Anna May Circa 1952 – Put-In-Bay Miller Ferry Co. 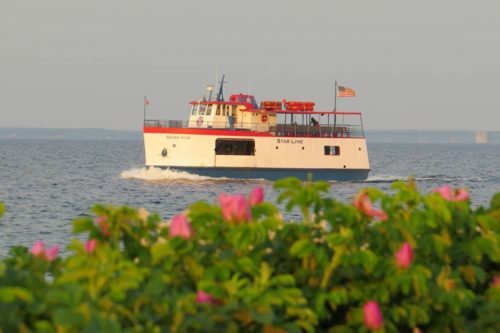 Built in Sturgeon Bay Wisconsin in 1947 she was originally named West Shore and began service for Miller Ferry hauling people and freight to Put-in-Bay in Lake Erie. She spent a short time at Beaver Island in Lake Michigan before moving on to Bay City Boat Lines in Lake Huron where she was purchased by Star Line in 2012.